PRINCETON (US)—All sweeteners are not equal when it comes to weight gain. Rats with access to high-fructose corn syrup gained significantly more weight than those with access to table sugar, even when their overall caloric intake was the same, new research shows. Long-term consumption of high-fructose corn syrup also led to abnormal increases in body fat, especially in the abdomen, and a rise in circulating blood fats called triglycerides. The Princeton University researchers say the work sheds light on the factors contributing to obesity trends in the United States. In results published online by the journal Pharmacology, Biochemistry and Behavior, the researchers reported on two experiments investigating the link between the consumption of high-fructose corn syrup and obesity. The first study showed that male rats given water sweetened with high-fructose corn syrup in addition to a standard diet of rat chow gained much more weight than male rats that received water sweetened with table sugar, or sucrose, in conjunction with the standard diet. The concentration of sugar in the sucrose solution was the same as is found in some commercial soft drinks, while the high-fructose corn syrup solution was half as concentrated as most sodas. The second experiment—the first long-term study of the effects of high-fructose corn syrup consumption on obesity in lab animals—monitored weight gain, body fat, and triglyceride levels in rats with access to high-fructose corn syrup over a period of six months. Compared to animals eating only rat chow, rats on a diet rich in high-fructose corn syrup showed characteristic signs of a dangerous condition known in humans as the metabolic syndrome, including abnormal weight gain, significant increases in circulating triglycerides and augmented fat deposition, especially visceral fat around the belly. Male rats in particular ballooned in size: Animals with access to high-fructose corn syrup gained 48 percent more weight than those eating a normal diet. The researchers note that they do not know yet why high-fructose corn syrup fed to rats in their study generated more triglycerides, and more body fat that resulted in obesity. “Our findings lend support to the theory that the excessive consumption of high-fructose corn syrup found in many beverages may be an important factor in the obesity epidemic,” Avena says. 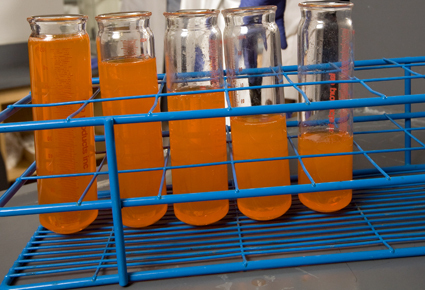 In the future, the team intends to explore how the animals respond to the consumption of high-fructose corn syrup in conjunction with a high-fat diet—the equivalent of a typical fast-food meal containing a hamburger, fries and soda—and whether excessive high-fructose corn syrup consumption contributes to the diseases associated with obesity. Another step will be to study how fructose affects brain function in the control of appetite. The research was supported by the U.S. Public Health Service. Does media multitasking boost obesity risk?